Les Grottes de Roffy is a small and friendly campsite that occupies a wonderful rural location deep in the heart of the Dordogne countryside, a short distance from the medieval town of Sarlat. Set within 5 hectares of pleasantly landscaped grounds, this charming 4 star campsite is just perfect for those looking to get away from it all and unwind. The glorious countryside setting gives you a real feeling of being at one with nature and the lovely trees, bushes and flowers not only provide shade but also privacy. Although the campsite is fairly small, what it lacks in pitches it makes up with in charm with many of the facilities such as the reception and restaurant being located in traditional converted sand coloured stone barns. One of the great things about Les Grottes de Roffy is the campsite’s location. Surrounded by some truly wonderful countryside, visitors are given the opportunity to get out and explore all that’s best about the Dordogne. Go for a walk, jump on your bike, go for a drive or even take an excursion down the river in a canoe the choice is yours. At the heart of Les Grottes de Roffy is its attractive swimming pool complex. Boasting three swimming pools, a wellness area, a selection of slides and a lovely sun terrace, we’re sure that you and your family will have a truly fabulous time. 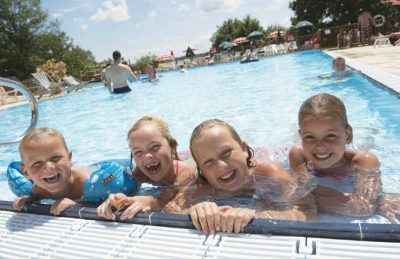 Les Grottes de Roffy campsite offers a comprehensive selection of activities and facilities on site and also nearby to ensure you have a fantastic family holiday. On-site activities at Les Grottes de Roffy campsite include tennis, table tennis, football, badminton, boules, archery, playground and cycle hire. Facilities available at Les Grottes de Roffy campsite include WIFI, restaurant, snack bar, takeaway, bar, groceries, games room, tv room, animation team, washers and dryers. Accommodation at Les Grottes de Roffy campsite includes a range of 2 and 3 bedroom mobile homes that are available from Eurocamp.